Chamomile Breathing – A guide for children, yet perfect for all! Chamomile breathing is a simple technique that is proven to help you feel calmer and more relaxed. It’s so easy to learn, you’ll be able to do it at home or at school, or whenever, wherever, you want to feel relaxed. Imagine you have a chamomile flower sitting right inside your tummy. Is it fully open yet? Maybe you can visualise the textures, smell and sounds of it. As you take a big, deep breath in through your nose, you can imagine the air flowing down inside to open up the flower head – expanding it until it is completely open. Next, as you breathe out through your mouth you can imagine the flower head gently deflating and folding itself up into a little bud. The deeper your in-breath, the fuller the imaginary flower head becomes. Your tummy will look like it has a balloon inside it when you make deep in-breaths. The longer your out-breath, the smaller your tummy becomes. Your tummy will feel like it’s shrinking inside if you are making long out-breaths. Make your in-breath and out-breath last for the same amount of time – maybe each to a count of 3 or 4? After a short while you can begin to make the out-breath last longer than the in-breath – maybe in-breath for a count of 3 and out-breath for a count of 5? Feel your tummy muscles expand and deflate, see the chamomile flower inside your imagination, gently opening and closing its petals. Check to discover where in your body do you feel most relaxed? Perhaps it’s your shoulders, or your back? Maybe it’s somewhere else? Remember! When your body feels relaxed and your mind becomes calmer, you feel happier and more able to cope with life’s whirlwinds. Where else could this technique be useful to you? At school? Before bed? Somewhere else? Obviously you are not really breathing into your tummy! In fact you are breathing into the lower lobes of your lungs and your diaphragm pushes against part of your nervous system telling it to relax more. The visualisation technique (of a chamomile flower) helps your mind to learn faster, become more creative and solve problems more easily. Did you know that Einstein (a very smart guy) was a big fan of visualisations? 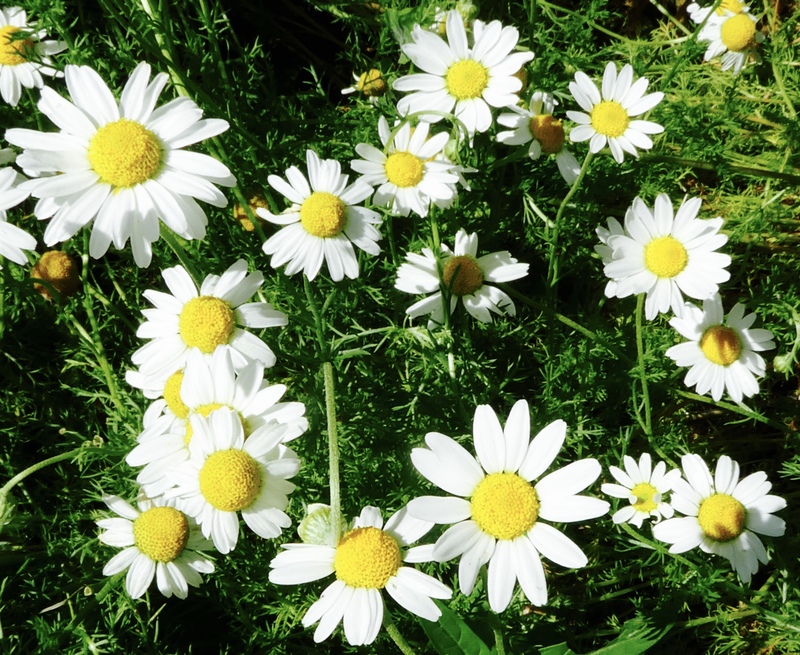 The plant called chamomile really does help you relax. Perhaps you’ve heard about chamomile tea or essential oil? There are special chemicals in chamomile that tell your nervous system to relax; one of these is called pinene. As you inhale the chamomile scent, special chemicals can reach your brain and help you relax more and feel less stressed. Maybe you will even feel a little sleepy. Chamomile is often used to help people sleep better. The breathing activity acts on the parasympathetic nervous system proven to calm. And science shows the phyto-chemistry of chamomile acts on the calming (GABA) pathways in the brain; chamomile can be mildly sedative. Chamomile is a gentle herb that is popularly drunk as a tea. It is also popular as an essential oil (added to an aroma diffuser or as drops in a bath or on a tissue). There are many safe ways to experience the calming effects of chamomile including making a poultice for pain. The flowering plant is called German (Chamomilla recutita, syn. Matricaria recutita). Its effects are anti depressant, reducing osteoporosis pain and the essential oil treats generalized anxiety disorder. The non flowering plant (lawn) is called Roman (Chamaemelum nobile treneague, syn. Anthemis nobles). Clinically a mild sedative, anti-convulsant (childhood), analgesic (teething and earache), digestive and sleep promoter and its essential oil is verified for nervous afflictions like insomnia and anxiety. Always consult a registered medical herbalist & inform your healthcare practitioner before taking or giving a child any herb medicinally. And be sure of the identity of your plant.